It is the synergy created by bringing these tools together—linked by officers with tactical experience and educated in the analytical techniques—which this paper addresses. We provide it as an example of military operations research in practice to advance naval force development and fleet combat tactics. We tell this story through the lens of our co-author, LT John Tanagela, USN, and one technology, the Medium Displacement Unmanned Surface Vessel (MDUSV), but provide multiple examples of past work similar in nature. LT Tanagela is a qualified Surface Warfare Officer who chose to attend the Naval Postgraduate School to obtain a master’s degree in Operations Research. We select John’s educational and research experience not for its uniqueness, but instead for its normalcy as a NPS OR student with unrestricted line qualifications. Our other co-authors were John’s combat models instructor, campaign analysis instructor, wargaming instructor, and thesis research advisors. We provide descriptions and results from the analytical courses John leveraged to advance his research in employing a MDUSV and highlights from his thesis. We conclude with brief summaries of other concepts and technologies advanced in this manner. 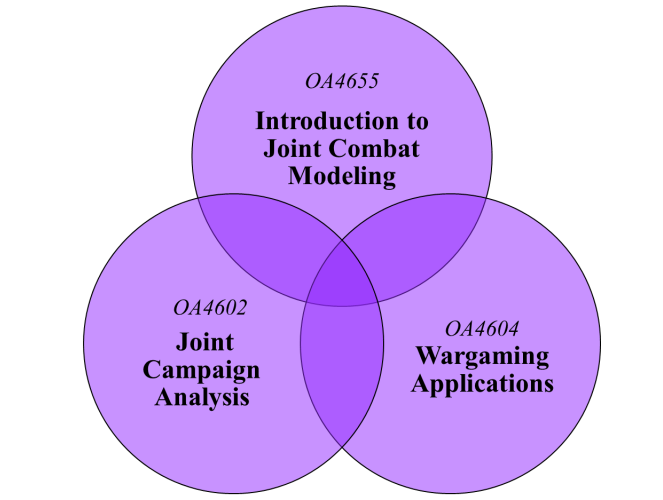 The Naval Postgraduate School’s Operations Research students receive three foundational courses in warfare analysis: the introduction to joint combat modeling course, the joint campaign analysis course, and the wargaming course (See Figure 1). In these applied courses they learn to model combat effects in tactical and operational level conflict, integrate these quantitative techniques in campaign analysis and human decision making, and, as a result, develop and quantitatively assess new concepts, tactics, and technologies. Figure 1: The three warfare analysis courses provided to NPS operations research students. The joint combat models course introduces traditional force-on-force modeling, including homogeneous and heterogeneous Lanchester equations, Hughes’ salvo equations, and computer-based combat simulations. It provides our officers the experience to integrate uncertainty into these models to allow for sensitivity analysis and design of experiments in exploring new capabilities. The joint campaign analysis class leverages these new skills and previous course work in simulation, optimization, decision analysis, search theory, and probability theory by challenging our officers to apply them in a campaign-level scenario. During the course they must develop a concept of operation to meet campaign objectives, model that concept to assess risk using appropriate measures for their objective, and assess “new” technical capabilities by comparing them to their baseline concept analytical results. The results are quantitative military assessments of new concepts and technologies, identification of force capability gaps, and risk assessments (See Figure 2). Figure 2: The NPS Joint Campaign Analysis class process for applying officers’ new analytical skills to campaign and operational level issues. 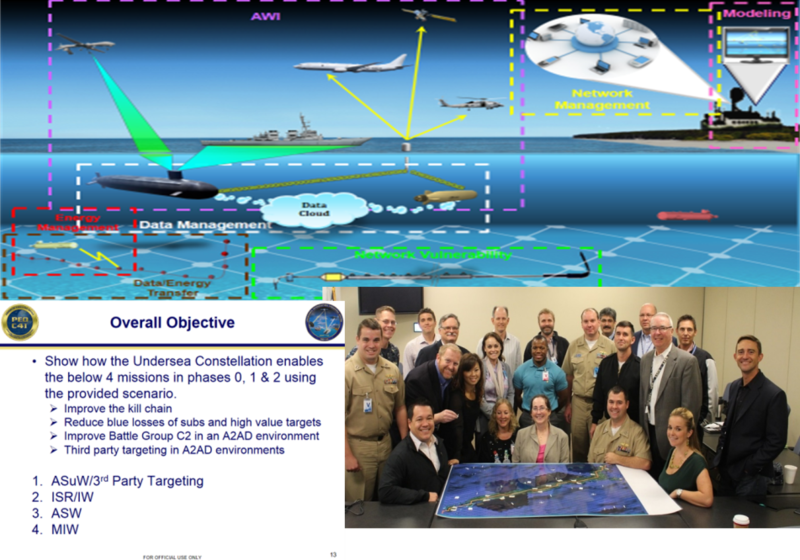 Figure 3: Sponsor, student wargaming team (in uniform) and players of the NPS wargaming course’s PEO C4I Undersea Constellation Game. As the NPS operations research students proceed from one course to another in the triad above—where they are joined by Joint Operational Logistics students, Systems Engineering Analysis students, Defense Analysis students, and Undersea Warfare students—there is an opportunity to carry lessons from on course into another, and gain further insight into those concepts and technologies. The teaching faculty work closely to ensure that happens by design. NPS Warfare Analysis faculty and researchers use these courses synergistically to provide insights to real-world sponsors in advancing their concepts, assessing new technologies proposed by DoD labs and industry, and developing new tactics—all the while enhancing our officer-students’ educational experience and sharpening their combat skills. For example, after learning to model a war at sea strike using salvo equations in the joint combat modeling course, the officers are challenged to develop a maritime concept of employment using distributed forces in the joint campaign analysis class, and assess that concept using the salvo equations and simulation. That concept is passed to the wargaming class (usually the same students) to better understand Blue’s decisions in employing distributed forces and Red’s potential reactions. Common scenarios are used between classes with similar forces structures (See Figure 4). Figure 4: The NPS Joint Campaign Analysis and Wargaming connection. 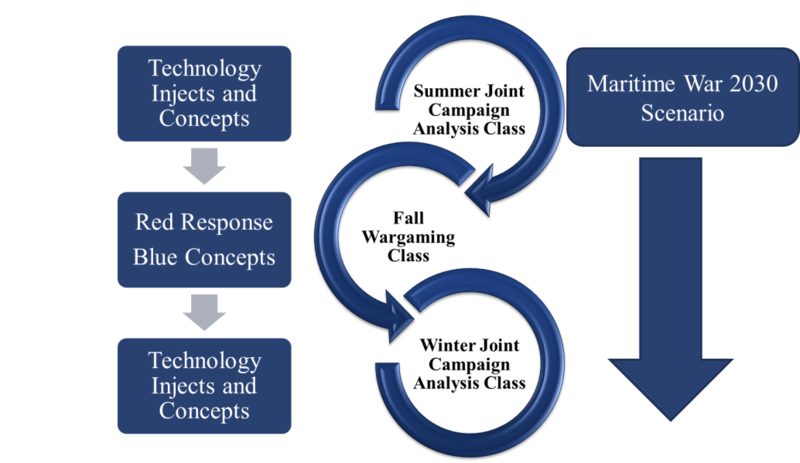 Technologies and concepts analyzed in the Joint Campaign Analysis class are frequently introduced by real-world sponsors in the wargaming class to better understand Blue’s force employments and Red’s reactions to new Blue capabilities. The results of these capstone classroom efforts are a series of analytical and wargaming briefings, reports, and papers frequently shared with DoD and service organizations. In addition, the work informs other NPS research occurring in unmanned systems, networks, and command and control. Most impactful, however, is when officers are inspired to take a much more detailed look at new capabilities as their thesis research, using the insights gathered from their capstone course work as a foundation to build upon. 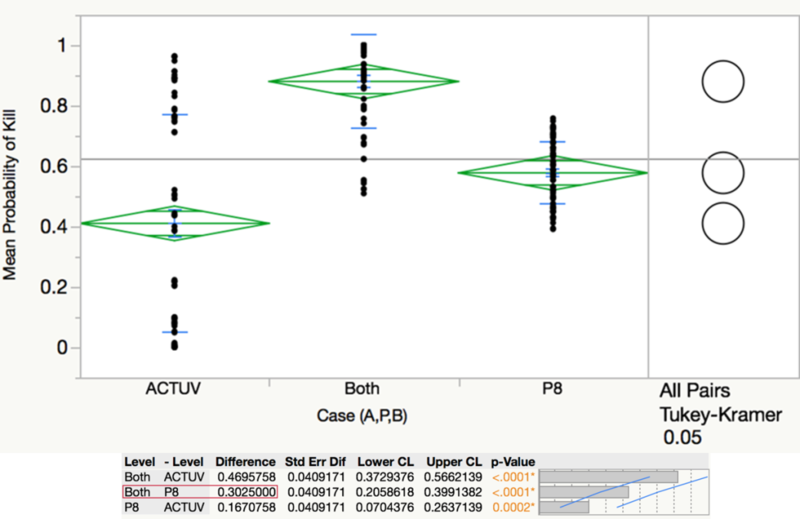 Figure 5: Using simulation, intelligent experimental design, and advance data analytics to identify the most import performance parameters of a technology or tactical employment. These theses’ results are always of great value to warfare and tactics development commands, to resources sponsors, material commands, and defense laboratories developing new technologies. Their insights also inform future capstone course work and NPS technical research. We now turn to our specific example, LT John Tanalega and the Medium Displacement Unmanned Surface Vessel. The Office of Naval Research (ONR) Medium Displacement Unmanned Surface Vessel (MDUSV) program is a self-deployed surface unmanned system capable of on station times of 60-90 days with ranges of 900-10000 nautical miles depending on speed (3-24 knots) and payload (5-20 tones).5 For the NPS warfare analysis group, we provide it the following future mission capabilities. In an antisubmarine warfare (ASW) role, it receives an off-board cue and hand off, then conducts overt trail with active sonar. It can act as an ASW scout in coordination with area ASW assets like the P-8 maritime patrol aircraft or benthic laid sensors in an Undersea Constellation, conducting large acoustic surveillance using passive and/or active bi-static sonar. It can deploy three Mk 54 or six smaller CRAW torpedoes. In its Intelligence, Surveillance, and Reconnaissance (ISR) role, it can work with surface ships as an advanced scout employing passive sensors, and in an offensive role, can carry eight RBS-15 surface-to-surface missiles. In its mine warfare role, it can conduct mine sweeping with a MK-104 acoustic sweep body or can deploy a clandestine delivered mine in an offensive mining role. It may also act as a forward environmental survey ship, a platform for operational military deception, a tow for a logistics barge, and special operations equipment delivery. All MDUSVs in these analyses are augmented by TALON (Towed Airborne lift of naval systems)6, which can carry up to 150 pounds of payload up to 1,500 feet. This payload can be communication relays, radar, electronic jammers (or emitters for decoy operations), or optical sensors. The MDUSV equipped with TALON has been introduced in several Joint Campaign Analysis classes and Wargaming classes as technical injects to be assessed. LT Tanalega was given the MDUSV as a technical inject for both these classes. Academically talented, John has a typical operational background for a Naval Postgraduate School Operations Research student. He graduated from the U.S. Naval Academy in 2011 with a Bachelor of Science degree in English. His initial sea tour was as Auxiliaries and Electrical Officer, and later First Lieutenant, in USS DEWEY (DDG 105). While assigned to DEWEY, he deployed to the Western Pacific, Arabian Gulf, Red Sea, and Eastern Mediterranean. His second division officer tour was as the Fire Control Officer in USS JOHN PAUL JONES (DDG 53), the U.S. Navy’s ballistic missile defense test ship. He attended the Naval Postgraduate School in from 2016 to 2018, where he earned a Master of Science degree in Operations Research and conducted his thesis research in tactical employment of the MDUSV. As mentioned, the MDUSV with TALON was introduced to a series of Joint Campaign Analysis classes and several NPS wargames. Officer-students have employed it in a variety of missions, from active operational deception to logistics delivery to riverine patrol. Its strongest characteristics are on-station time over unmanned aerial systems, sensor payload capacity over all other unmanned systems, and speed over unmanned underwater systems. Its limitations include vulnerability to attack (it has no active defense), which is mitigated by a low radar cross section making it difficult to target and/or acquire. Our analytical and wargaming teams have found their value forward in offensive naval formations and in defense screening formations (Figure 5). Employing a single or pair of MDUSV with a P-8 maritime patrol aircraft in an area ASW environment is also valuable. (Figure 6). Figure 5: The graph shows the probability of successfully finding and engaging an adversary’s amphibious task force in a South China Sea scenario with a traditional U.S. Surface Action Group (SAG) with and without allied ship support. As MDUSVs are added to the SAG, the probability of mission success is increased. The MDUSV are contributing to the ISR and targeting capabilities of the SAG. This analysis was produced using combat modeling by a Joint Campaign Analysis class team. Figure 6: This plot shows the simulation results of an Area ASW engagement between a PLA Navy SSK submarine and the MDUSV alone (labeled ACTUV or Anti-Submarine Warfare Continuous Trail Unmanned Vessel, the original DAPRA program name); the MDUSV with a P-8 (labeled both), and the P-8 alone. The Tukey-Kramer test displays significant improvement with the MDUSV and P-8 work as an unmanned-manned pair. Unique employment concepts are also developed, such as employing paired MDUSVs working as an active-passive team for both active radar and acoustic search. This information is passed to both sponsors and the NPS combat systems research faculty for engineering analysis. LT John Tanalega’s Joint Campaign Analysis efforts included analyzing the MDUSV’s contribution to a scouting advantage for Blue forces in a surface-to-surface engagement (see figure 5). While a student in the NPS Wargaming Class, John’s team designed, developed, and executed a classified South China Sea game for United States Fleet Forces Command exploring distributed maritime operations and a force structure that included the MDUSV. Lessons from both classes were then applied to his further research in the MDUSV’s best tactical employment in a surface to surface engagement. In transitioning MDUSV from technical concept to operational reality, several questions are prominent. First, MDUSV is just what its name implies—a vessel. The specific technologies which will make it effective in the maritime domain are all in various stages of development, and they are too numerous for MDUSV to carry all of them. Therefore, an exploration of which capabilities improve operational effectiveness the most is essential. Second, while superior technology is necessary, alone it is not sufficient. USVs must also be used with effective tactics, techniques, and procedures (TTPs) to make them effective SUW platforms. USVs are entirely new to the U.S. Navy, and no historical data exists for their use in combat. Modeling, simulation, and data farming7 provide an opportunity to explore concepts and systems that, today, are only theories and prototypes. Computer-based modeling and simulation are an effective means of exploring MDUSV capabilities and tactics. Live experiments at-sea are always important to gather real-world data and provide proofs of concepts. However, they require a mature design. They are prohibitively expensive, and the low number of trials that can be conducted reduces the confidence levels of their conclusions. 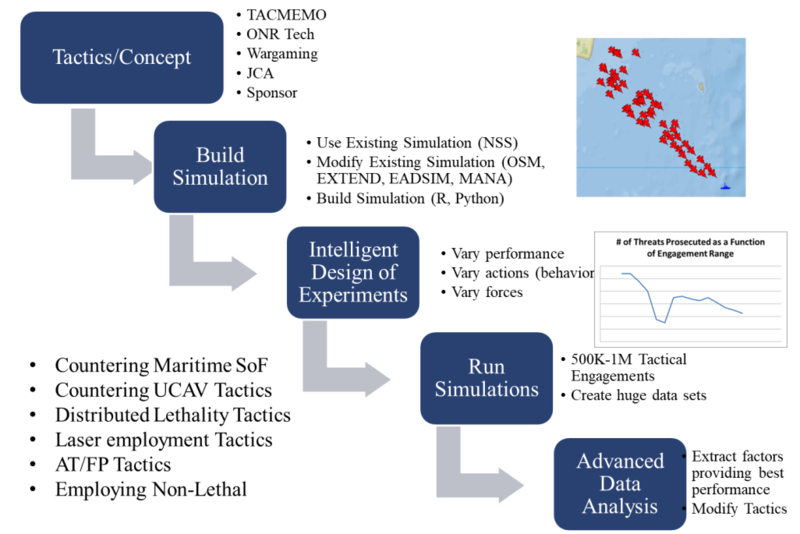 Computer-based modeling and simulation allows us to run tens of thousands of experiments over a wide range of factors. It is, therefore, better suited for design exploration. Using high-performance computing and special techniques in design of experiments (DoE), such as nearly orthogonal and balanced (NOB) designs, simulation experiments that would have taken months or years with legacy factorial designs can be can be performed in a matter of days. This highly efficient technique provides greater insights that inform and direct live experimentation and requirements development. To explore the effects of MDUSV on surface warfare, LT Tanalega used the Lightweight Interstitials Toolkit for Mission Engineering using Simulation (LITMUS), developed by the Naval Surface Warfare Center, Dahlgren Division (NSWC DD). 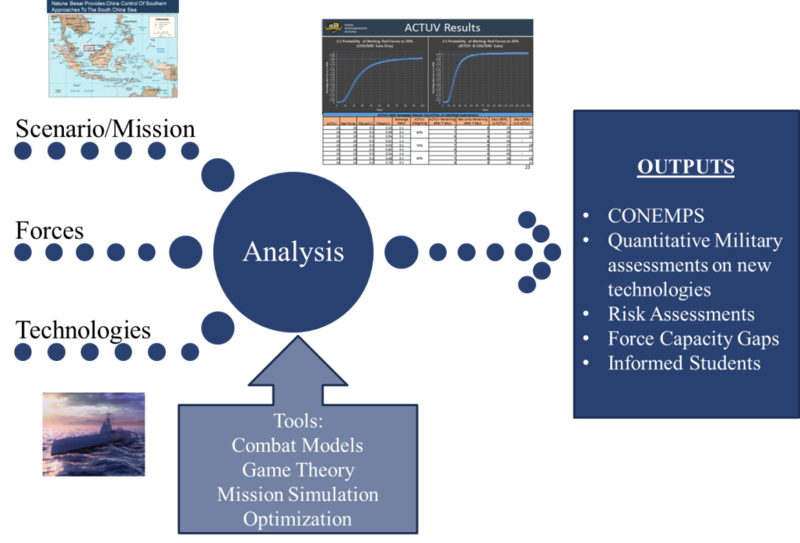 LITMUS is an agent-based modeling and simulation tool suited specifically to naval combat. Ships, aircraft, and submarines are built by users and customized with weapons, sensors, and behaviors to mirror the capabilities and actions of real-world combat systems. Using an efficient design of experiments and LITMUS scenario, over 29,000 surface battles were simulated with varied active and passive sensor ranges, MDUSV formations and armament, and emissions control EMCON policies. Analysis of the simulation output shows that a traditional Blue force combating a very capable Red force in its home waters has 19 percent probability of meeting first-to-fire criteria (See Table 1). Blue surface forces equipped with MDUSV are nearly three times as likely to be first-to-fire. Analysis also found the increase in performance is due primarily to the extended sensor range afforded by the TALONS platform on scouting MDUSV. 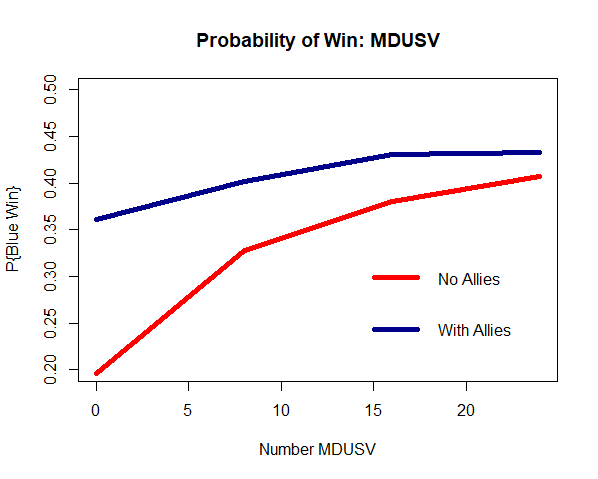 Based on the presence of MDUSV alone, Blue improves its probability of being first-to-fire by a factor of nearly three (from 19 percent to 56 percent), as shown in Table 1. Though a SAG will likely have helicopters embarked, it is important to note that helicopters are more limited in endurance. Further, the use of a helicopter in Phase II of a conflict poses exceptional risk to human pilots, especially if the enemy is equipped with capable air defense systems. We therefore modeled “worst case” without an airborne helo during the engagements. Given the long endurance of MDUSV and its autonomous nature, MDUSV represents a worthwhile investment for the surface force. When numerically disadvantaged and fighting in dangerous waters, MDUSV levels the odds for Blue. Advanced partition tree analysis of the data noted a breakpoint at an MDUSV passive sensor range of 36nm. With this range or greater, Blue was first-to-fire in 81% of the design replications (Table 2). Using the mathematical horizontal slant range formula to approximate visual horizon, this equates to a tether height of approximately 1020 feet. Given the current 150-pound weight limit for a TALONS payload, a passive electro-optical sensor may be more feasible than an active radar. Placing a high power radar, with power amplification, transmission, and signals processing in a TALONS mission package may not be feasible in the near term. Further study, from an electrical engineering and systems engineering perspective, is required. While arming MDUSV provides a marginal increase in first-to-fire performance with EMCON policies 1 and 2, it has a small negative effect with EMCON policy 3. Ultimately, first-to-fire in each replication is driven by scouting—who saw whom and fired first. Since detecting the enemy is a necessary condition to shooting him, providing MDUSV with over the horizon sensor capabilities should be the first concern. This will allow the missile shooters of the surface and air forces to employ their weapons without emitting with their own sensors. The Fleet Design Wargame consisted of three separate gameplay sessions. During each session, the BLUE Team received a different order of battle. During gameplay, the study team observed the players’ decisions to organize and maneuver their forces, as well as the rationale behind those decisions. After two to three turns of gameplay, a member of the study team facilitated a seminar in which all players discussed the game results. Each team, BLUE and RED, had a leader playing as the “Task Force Commander,” and a supporting staff. The Blue Team consisted of three SWOs, a Navy pilot, an Air Force pilot, a Navy cryptologic warfare officer, two human resources officers, and a supply officer. The RED team consisted of three SWOs, one Marine NFO, one Navy cryptologic warfare officer, two Naval intelligence officers, and two supply officers. Search was adjudicated using probability tables and dice. Combat actions are being analyzed using combat models, such as a stochastic implementation of the salvo model. The game demonstrated the combat potential that networked platforms, sensors, and weapons provide. Long endurance systems, such as the MQ-4C Triton and the Medium Displacement Unmanned Surface Vehicle (MDUSV) can be the eyes and ears of missile platforms like destroyers. The game also showed that with its range alone, an ASuW-capable Maritime Strike Tomahawk provides BLUE forces with greater flexibility when stationing units. On the other hand, unmanned systems also provide RED with a wider range of options to escalate and test U.S. resolve during phase 1. The study team also found that expeditionary warfare can have a double effect on the sea control fight. The presence of an LHA is a “double threat” to the enemy, acting as both an F-35B platform, and as a means of landing Marines. Future research is required to optimize MDUSV design and to better characterize the human element of MDUSV employment and coordination. While TALONS provides a unique elevated sensor platform, a 150-pound maximum payload will be a considerable constraint. Passive sensors, such as EO/IR, may be mounted on the TALONS platform, but the weight required to house a high-performance radar will be a higher hurdle to overcome. Though this can be mitigated by changing the parasail design to increase lift, this will require more in-depth study of the engineering trade-offs. Also, the process will have to be automated. TALONS testing to-date has involved members of the test team deploying and recovering it. Though this study was performed with software-driven automata, the tactical decisions leading-up to the placement of MDUSV will be made by humans. The long endurance of MDUSV makes it an ideal platform for deception. Tactical and operational level wargaming may yield insight into the affect that adding MDUSV will have on human decision-making. As this study was the first SUW simulation of a man-machine teamed force, the scope of the agents explored was purposefully limited. To add to the realism of the experiment, and to explore future tactics, the addition of helicopters and other scout aircraft to the scenario may yield further insight into the design requirements and tactical employment of MDUSV. MDUSVs in this study were homogenously equipped and shared the same EMCON policy. However, if each MDUSV is given only one capability, such as a particular sensor type or a weapon, their strengths may offset their weaknesses. Grouping several MDUSVs with different mission load-outs may be an alternative to sending a manned multi-mission ship like a DDG. It may also prove to be more resilient to battle damage, as the loss of a single MDUSV would mean the loss of an individual mission, while the mission-kill of a DDG would result in a loss of all combat capability. Further simulation and analysis with LITMUS may yield insights into this trade-off. Although we have highlighted LT Tanalega’s recent research to demonstrate how the NPS Warfare Analysis group integrates officer’s tactical experience, classroom work, and more detailed research to provide insights in new technologies, tactics, and operational concepts, many other examples can be mentioned. These include tactics to defeat swarms of unmanned combat aerial vehicles, best use of lasers aboard ships, developing tactics to counter maritime special operations insertion, employing expeditionary basing in contested environments, exploration in distributed logistics, best convoy screening tactics against missile-capable submarines, and use of sea bed sensors and systems. Analytical red teaming is also used for sponsors wishing to better understand the resilience and vulnerability of their new systems—employed in the same classes mentioned in this paper. These results are shared with DoD and Navy sponsors interested in getting robust and quantitative assessments of the strengths and weaknesses of their systems. Although the NPS Warfare Analysis group is pleased to make real-world contributions as part of our students’ education experience, our greatest satisfaction comes from observing the junior officer’s military professional growth that accompanies the application of their newly learned analytical skills. To model and analyze an engagement, a thorough understanding of the tactical factors and performance parameters is necessary. By the end of our students’ experience, they have gained expertise in that mission and in operations analysis—a perfect blend to contribute to our nation’s future force architecture and design. LT John F. Tanalega is a Navy Surface Warfare Officer from North Las Vegas, Nevada and is a 2011 graduate of the United States Naval Academy His first operational tour was as Auxiliaries and Electrical Officer, and later as First Lieutenant, in USS DEWEY (DDG 105). He next served as Fire Control Officer in USS JOHN PAUL JONES (DDG 53). As an operations analysis student at the Naval Postgraduate School, his research focused on combat modeling, campaign analysis, and analytic wargaming. After graduating from NPS, he reported to the Surface Warfare Officer School (SWOS) in Newport, Rhode Island, in preparation for his next at-sea assignment. 8. Hughes, W.P., Fleet Tactics and Coastal Combat, 2nd ed, Naval Institute Press, Annapolis, Maryland, 2000. 9. Wagner D.H., Mylander, W.C., Sanders, T.J., Naval Operations Analysis, 3rd ed, Naval Institute Press, Annapolis, Maryland, 1999, pp 109-110. Unmanned Systems: A New Era for the U.S. Navy? The U.S. Navy’s Unmanned Systems Directorate, or N99, was formally stood up this past September with the focused mission of quickly assessing emerging technologies and applying them to unmanned platforms. The Director of Unmanned Warfare Systems is Rear Adm. Robert Girrier, who was recently interviewed by Scout Warrior, and outlined a new, evolving Navy Drone Strategy. The idea is to capitalize upon the accelerating speed of computer processing and rapid improvements in the development of autonomy-increasing algorithms; this will allow unmanned systems to quickly operate with an improved level of autonomy, function together as part of an integrated network, and more quickly perform a wider range of functions without needing every individual task controlled by humans. “We aim to harness these technologies. In the next five years or so we are going to try to move from human operated systems to ones that are less dependent on people. Technology is going to enable increased autonomy,” Admiral Girrier told Scout Warrior. Called the Sea Hunter, the vessel is a demonstrator version of an unmanned ship that will run autonomously for 60 – 80 days at a time. 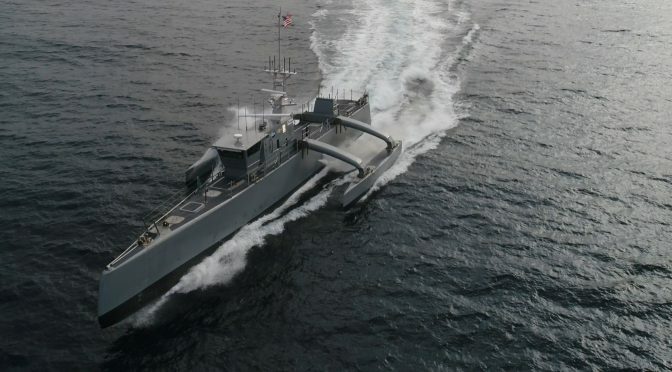 Known officially as the Anti-Submarine Warfare Continuous Trail Unmanned Vessel (ACTUV), the program started in 2010, when the defense innovations lab decided to look at what could be done with a large unmanned surface vessel and came up with submarine tracking and trailing. “It is really a mixture of manned-unmanned fleet,” said program manager Scott Littlefield. The big challenge was not related to programming the ship for missions. Rather, it was more basic – making an automated vessel at sea capable of driving safely. DARPA had to be certain the ship would not only avoid a collision on the open seas, but obey protocol for doing so. As further evidence of the Navy’s progress toward computer-driven drones, the Navy and General Dynamics Electric Boat are testing a prototype of a system called the Universal Launch and Recovery Module that would allow the launch and recovery of unmanned underwater vehicles from the missile tube of a submarine. 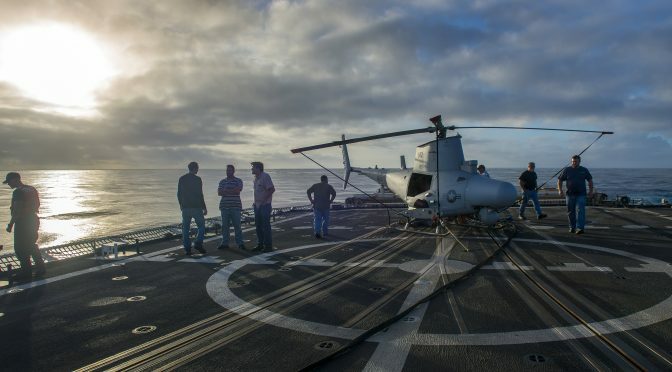 The Navy is also working with platforms designed to collect oceanographic and hydrographic information and is operating a small, hand-launched drone called “Puma” to provide over-the-horizon surveillance for surface platforms. Both DARPA and the Office of Naval Research also continue to create more sophisticated Unmanned Aircraft Systems. 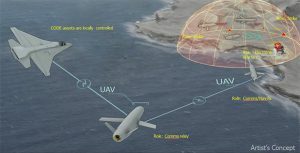 DARPA recently awarded Phase 2 system integration contracts for its CODE (Collaborative Operations in Denied Environment) program to help the U.S. military’s unmanned aircraft systems (UAS) conduct dynamic, long-distance engagements against highly mobile ground and maritime targets in denied or contested electromagnetic airspace, all while reducing required communication bandwidth and cognitive burden on human supervisors. CODE’s main objective is to develop and demonstrate the value of collective autonomy, in which UAS could perform sophisticated tasks, both individually and in teams under the supervision of a single human mission commander. The ONR LOCUST Program allows UAVs (Unmanned Aerial Vehicles) to stay in formation with little human control. At a recent demonstration, a single human controller was able to operate up to 32 UAVs. The principle by which individual UAVs are able to stay in formation with little human control is based on a concept called “swarm intelligence,” which refers to the collective behavior of decentralized, self-organized systems, as introduced by Norbert Wiener in his book, Cybernetics. Building on behavioral models of animal cultures such as the synchronous flocking of birds, he postulated that “self-organization” is a process by which machines – and, by analogy, humans – learn by adapting to their environment. Self-organization refers to the emergence of higher-level properties and behaviors of a system that originate from the collective dynamics of that system’s components but are not found in nor are directly deducible from the lower-level properties of the system. Emergent properties are properties of the whole that are not possessed by any of the individual parts making up that whole. The parts act locally on local information and global order emerges without any need for external control. In short, the whole is truly greater than the sum of its parts. There is also a relatively new concept called “artificial swarm intelligence,” in which there have been attempts to develop human swarms using the internet to achieve a collective, synchronous wisdom that outperforms individual members of the swarm. Still in its infancy, the concept offers another approach to the increasing vulnerability of centralized command and control systems. Perhaps more importantly, the concept may also allay increasing concerns about the potential dangers of artificial intelligence without a human in the loop. A team of Naval Postgraduate researchers are currently exploring a concept of “network optional warfare” and proposing technologies to create a “mesh network” for independent SAG tactical operations with designated command and control. 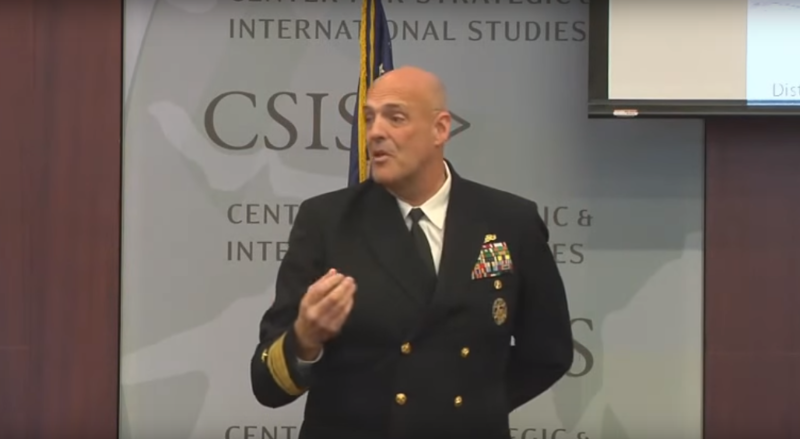 Adm. Girrier was quick to point out that the strategy – aimed primarily at enabling submarines, surface ships, and some land-based operations to take advantage of fast-emerging computer technologies — was by no means intended to replace humans. Rather, it aims to leverage human perception and cognitive ability to operate multiple drones while functioning in a command and control capacity. In the opinion of this author, a major issue to be resolved in optimizing humans and machines working together is the obstacle of “information overload” for the human. Leaders of the Surface Navy continue to lay the intellectual groundwork for Distributed Lethality – defined as a tactical shift to re-organize and re-equip the surface fleet by grouping ships into small Surface Action Groups (SAGs) and increasing their complement of anti-ship weapons. This may be an opportune time to introduce the concept of swarm intelligence for decentralized command and control. Technologies could still be developed to centralize the control of multiple SAGs designed to counter adversaries in an A2/AD environment. But swarm intelligence technologies could also be used in which small surface combatants would each act locally on local information, with systemic order “emerging” from their collective dynamics. Yes, technology is going to enable increased autonomy, as noted by Adm. Girrier in his interview with Scout Warrior. But as he said, it will be critical to keep the human in the loop and to focus on optimizing how humans and machines can better work together. While noting that decisions about the use of lethal force with unmanned systems will, according to Pentagon doctrine, be made by human beings in a command and control capacity, we must be assured that global order will continue to emerge with humans in control. Marjorie Greene is a Research Analyst with the Center for Naval Analyses. She has more than 25 years’ management experience in both government and commercial organizations and has recently specialized in finding S&T solutions for the U. S. Marine Corps. She earned a B.S. in mathematics from Creighton University, an M.A. in mathematics from the University of Nebraska, and completed her Ph.D. course work in Operations Research from The Johns Hopkins University. The views expressed here are her own. 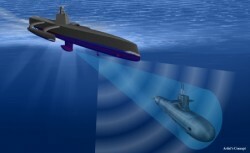 Last week the U.S. government’s defense technology innovator, DARPA, awarded Science Applications International Corporation (SAIC) a $58M contract to develop the next phases of its Anti-Submarine Warfare (ASW) Continuous Trail Unmanned Vehicle (ACTUV) technology demonstrator. Besides a fine example of the DoD’s love of nested acronyms, the ACTUV program provides a peek into the promises and challenges of the future of unmanned ASW. 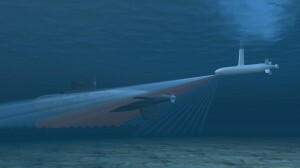 As stated in DARPA’s press release, the goal of the program is an “unmanned vessel that tracks quiet diesel electric submarines for months at a time spanning thousands of kilometers of ocean with minimal human input.” The website adds that an objective of generating a vessel design that “exceeds state-of-the art platform performance to provide complete propulsive overmatch against diesel electric submarines at a fraction of their size and cost.” In other words the vessel must be small and cheap (target cost goal of $20M apiece), yet robust enough to operate for 80 days and 6,200km without human maintainers or refueling. The approach the program takes for propulsion will be interesting to see develop, as most long-range drone concepts have relied on solar panels or wave propulsion at the sacrifice of top speeds. Part of ACTUV’s endurance and speed will come from the drone’s design. According to navaldrones.com, the SAIC-built concept’s use a trimaran hull seen (see the video) offers better speeds over long ranges than traditional monohull designs. Additionally, going sans-crew frees up space normally devoted to crew-support systems to fill with more fuel tanks. No one can escape my cones of many colors! the ACTUV – through “a sparse remote supervisory control model” – will decrease its susceptibility to hacking. However the need for two-way contact through communication and command protocols will still create vulnerabilities to guard against. The more the ACTUV communicates, especially in transmission, the more it increases the chance of being detected. In fact, although as a smaller vessel it might have a radar cross section akin to a pleasure craft or fishing vessel, its speed, sensor suite, and the simple fact that it’s a surface vessel will probably make it rather easy to detect – especially by the sub it is following. As a whole, this vessel will probably not be that stealthy, more often used in “we don’t care you know we know” type situations. Automated responses also create the possibility of a dependable error that an enemy can exploit (think of a video game that freezes every time one particular action is performed). This is a more remote worry as the error would have to unknown or uncorrected by the U.S., be discovered by a foe, and be of practical tactical use (it doesn’t matter much if the ACTUV shuts down when trying to avoid whales if you can’t drive the ACTUV into a whale). Another interesting requirement is the need for ACTUV to abide by maritime traffic conventions and legal restrictions. In practice this means preventing it from, say, running over a civilian on a jet ski or straying into protected marine habitats. But the day will come when some unmanned surface or subsurface vehicle does cause damage, and the legal and operational fallout will be quite interesting to watch. If it proves successful, the ultimate benefit of an ACTUV follow-on is therefore that it will free up more expensive assets to do other things. As configured, an engagement would require integration with a weapon-delivery platform, most practically an aircraft. However, like the predator, which made its debut as a strictly ISR platform, a future iterations could quite conceivably carry their own weapons. The ACTUV is a program to keep an eye on.